TwinXL is proud to announce a new and exciting offer from DormBedding.com The $1000 #FortOnFleek Challenge Scholarship open to students across the country. As a fellow college linens provider, we understand the importance of education and want to spread awareness for institutions who support education in America. The challenge asks students to build a fort out sheets and blankets and post a photo of their creation on Instagram or Facebook. Pretty easy, right? After they post a photo they must tag #FortOnFleek and @DormBedding in order to be entered into the contest. 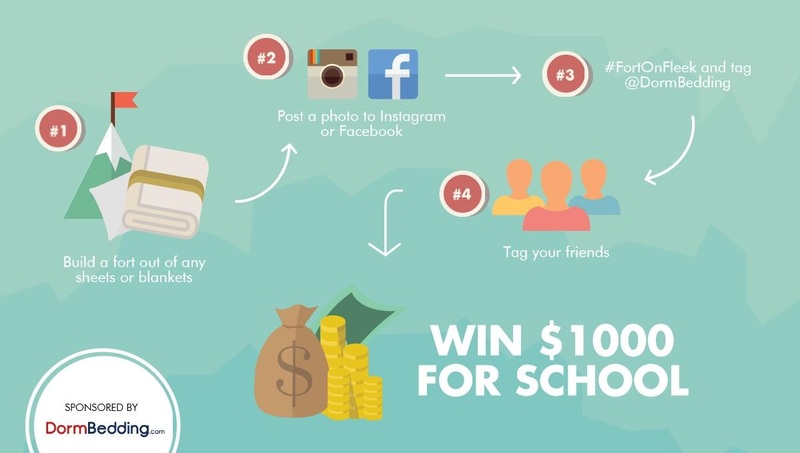 If students choose to tag their friends and one of their friends wins, that student gets $200! The contest is open until September 15, so get building! We, as well as DormBedding.com, are excited to see all the submissions and hope we can make a difference in the lives of the winning student. For full contest rules visit the #FortOnFleek Challenge website.